Former Israeli Foreign Minister Abba Eban coined the famous saying, which Israelis like to quote: “The Arabs [or the Palestinians] never miss an opportunity to miss an opportunity.” Indeed, from the Israeli perspective, it was always the Jews, or the Israelis, who said yes to any offer of compromise and peace, while the Arabs or the Palestinians were always the rejecting side. According to common wisdom in Israel, the Arab/Palestinian nay-saying only brought them losses while the Israeli willingness to say yes always gained. Enter Elie Podeh, professor of Middle East Studies at Hebrew University of Jerusalem. His new book, Chances for Peace: Missed Opportunities in the Arab-Israeli Conflict, draws a more complex picture. Podeh analyzes more than two dozen episodes in the history of the Arab-Israeli conflict, from the Faysal-Weizmann Agreement in 1919 to the Olmert-Abu Mazen talks in 2008, and concludes sadly that many of them were missed opportunities to achieve peace. However, the blame, according to Podeh, lies almost evenly on both sides. An opportunity is defined by Podeh as consisting of two elements: An initiative for peace and a significant process or event that enables the acceptance of such initiative. 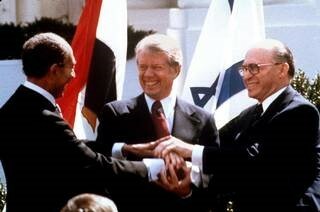 The peace treaty between Israel and Egypt is a case in point: There was the initiative of Sadat, from 1971 on, to break the deadlock with Israel, first by peace advances and, when these failed, by the Yom Kippur War; and then his dramatic visit to Jerusalem created the “trauma effect” that generated the necessary change of heart between the former enemies and enabled them to become partners in peace. This happy end, unfortunately, is the exception. Many other opportunities were missed. One notable example is the Israeli-Syrian negotiations, where, in 1999-2000, then-Syrian President Hafez Assad was ready to sign peace with Israel, and it was the rigidity of then-Israeli Prime Minister Ehud Barak that foiled it. On the other hand, according to Podeh again, Palestinian Chairman Yasser Arafat, by rejecting the “Clinton Parameters” in 2000, was responsible for missing the opportunity to make peace with Israel. Not all opportunities were entirely missed, and some were missed only partially. Podeh devised a smart analytical tool to test it, comprised of four variables: The legitimacy of leaders initiating peace, on both sides; their commitment and motivation to lead a change; the level of trust existing between them; and the constructive involvement of a third party. As I read this fascinating book, equipped with this tool, I felt like I’m looking at the history I thought I had known by heart, through an entirely fresh prism. But, according to Podeh and other scholars, something really amazing happened in between. It turns out that the Israeli peace proposal, which came out of that government meeting, was unknown to the Arabs — it was never delivered to them! A secret message went from Jerusalem to Washington only. The response said the Egyptians and the Syrians had rejected the Israeli initiative. That was it. Nobody in Israel bothered to investigate whether the message was discussed in Cairo and Damascus. The rest is history. Podeh calls it “an invisible missed opportunity”. Perhaps a future scholar will find out that Israelis and Palestinians are at this moment missing another “invisible opportunity” that we don’t know of today. There is, however, a visible one: The Arab Peace Initiative, proposed in 2002 by the same Arab League that 35 years ago had offered the three Nos. This time, Israel should be willing to take Yes for an answer. The Arab initiative is a problematic one, but it offers an alternative to bloodshed, and therefore should be investigated. This opportunity shouldn’t be missed.